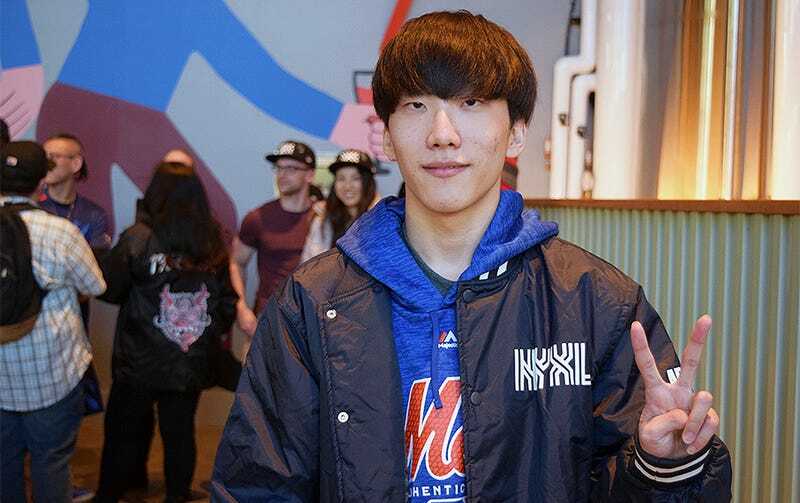 NYXL’s support player Ark at a brewery outside the Mets stadium. Overwatch’s Mercy is a “support” hero, which in layman’s terms means she’s mopping up trails of blood left behind after Overwatch battles. Mercy’s job is to heal her weak teammates, assisting them as they lay waste to enemies. It’s an apparently subservient job often painted as easy, and therefore, undervalued—that is, unless you’re Hong “Ark” Yeon-joon, arguably the best Mercy player in the world. And if you ask him, the best Mercy players are no one’s helpers. Now, Ark plays a lot of Mercy and, at the same time, is NYXL’s literal shot-caller. He tells people who to kill, where they need to be, and when they need to be there. Like his teammate Sung-hyeon “Jjonak” Bang, Ark has led NYXL to the top of the OWL standings by playing against his hero’s stereotypes. “I try to play selfishly,” Ark said. According to stats from Overwatch League analytics site Winstons Lab, Ark died only 2.7 times every 10 minutes in stage two, when the average across pros last stage was 4.3. But he also used his risky “resurrect” ability—which makes him momentarily vulnerable—less than any other pro, too. “I try to be alive all the time. If I die, I can’t heal. If I’m alive, I can heal afterwards,” he added. Sometimes sacrificing teammates in an effort to prevent further bloodshed, Ark looks out for number one. And he’s not the only so-called “support” player on NYXL who does so. The team’s Zenyatta player, Jjonak, is a damage-dealing monster who often side-steps bleeding-out teammates on his way to kill enemies. Playing selfishly is surprising advice coming from a nurse-turned-Mercy player, but it’s refreshing advice in a game where the players who kill are often the ones considered the most invaluable assets.